Bounty Tokens are used as indicators of how wanted you are by the authorities. The Bounty you get is always tied to the nation violated. So when engaging a Spanish Merchant you put a Spanish Bounty Token on your Player Board at the bottom of the "Bounty Track" where it says "1" - indicating you have 1 Spanish Bounty. Likewise if you engage a French (non-pirate) Player Captain you get a French Bounty and place it on the "1" space of the "Bounty Track". When you get an additional Bounty from a nation, you move the token in question up the track. So when getting a second Spanish Bounty you move the Spanish token up the track from "1" to "2" - The French Bounty Token is unaffected and remains in place. The "Bounty Track" goes as high as "5" which is the maximum amount of Bounties you can have from any single nation. Example: A pirate player scouts and declares he wishes to make a Merchant Raid. 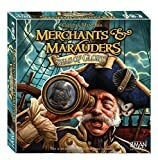 He flips the Merchant Token and sees that he has found a Spanish merchant. The player then announces that he wishes to go through with the Merchant Raid and thus immediately gets a Spanish bounty. Example 2: In a bold move a player chooses to engage a Dutch Naval ship. This immediately gets him a Dutch Bounty as the Naval ship is regarded a "non-pirate". The player also manages to win the battle and defeats the Dutch Naval ship. This gains him yet another Dutch Bounty due to the criteria "Defeating a Naval Ship". Generally, you cannot enter ports belonging to the nations you are wanted by. However, you can always enter your home-port and the pirate infested port of Port Royale allows you to enter for a small fee or an Influence roll (as described in the Sea-Zone info text on the board). Wanted by the Authorities: Naval Ships will attack you. Pirate Truce: NPC Pirate ships will no longer attack you. Worth a lot of Gold: The amount of Bounties you have from one nation indicates how much Gold that nation is willing to pay for your head - 5 Gold per bounty. Thus the more Bounties you have the more attractive it is for the other players to hunt you down. Generally speaking, once you get a Bounty your Captain is stuck with it. However, a few Glory Cards and Event Cards let you pay Gold to be pardoned. Likewise a few rumors or missions offer you some form of pardon. 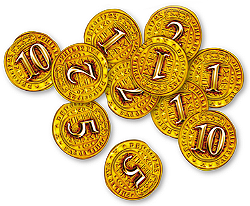 When you reduce a nation's Bounty to zero you may remove that nation's Bounty Token from your Player Board. This indicates that you are completely pardoned by that nation and can play as if you never had a Bounty from that nation. Defeating a player pirate can be a quite profitable business. For each Bounty a nation has put on a Captain's head it is willing to pay 5 Gold for his demise. After defeating a pirate player you can immediately claim 5 Gold per bounty from one of those nations (you cannot get a reward from a nation that has a bounty on your head, or which your nation is at war with). 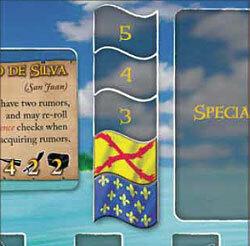 Example: You have just defeated a Pirate player with 3 Bounties from Spain and 1 from England. Claiming the 15 Gold reward from Spain would be nice, but since you have a Bounty from Spain yourself, you can only choose to claim the 5 Gold reward from England. Defeating an NPC pirate earns you a reward based on ship type (on the assumption that the bigger the ship the bigger the crimes). Defeating the Pirate Sloop earns you 5 Gold and defeating the Pirate Frigate earns you 15 Gold. Only non-pirates can claim such a reward.